Episode 3: Will the Real Charlie Chan Please Stand Up? 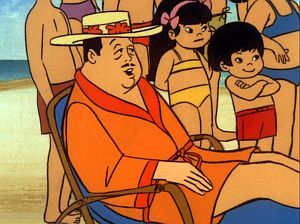 While on vacation with his family in Hawaii, Charlie Chan is accused of stealing jewelry from their hotel. Chan's kids assist the detective in proving his innocence as it becomes apparent that someone is impersonating their Pop while puling off a series of thefts. The title of this episode, Will the Real Charlie Chan Please Stand Up? is a reference to the catch phrase, "Will the real ____ please stand up?" from the popular television game show "What's My Line?" which ran from 1950-1975.